The flexible ASP.NET Core Scheduler, a.k.a. event calendar, offering various view modes, with a trendy and modern UI inspired by Google Calendar’s material design. The ASP.NET Core Scheduler, a.k.a. event calendar, facilitates almost all calendar features, thus allowing users to manage their time efficiently. It features easy resource scheduling, appointments rescheduling through editor pop-ups, drag and drop, and a resizing action. It includes wide variety of view modes with unique configuration options for each view. The ASP.NET Core Scheduler offers wide variety of view modes such as day, week, work week, month, agenda, month-agenda, and timeline views. It allows you to easily configure each individual view with different, view-specific options. Options also exist to display multiple days, weeks, and months by extending each view mode based on the interval count. Timeline scheduling plays a major role in the ASP.NET Core Scheduler, as it displays resources in rows in a hierarchical tree-like structure with expand and collapse options. Its feature-rich calendar options, compact resource scheduling, and clear event representation allows you to employ it in various real-time applications. You can also display the year, month, and week number text labels on each individual header row of timeline views with out-of-the-box templates. 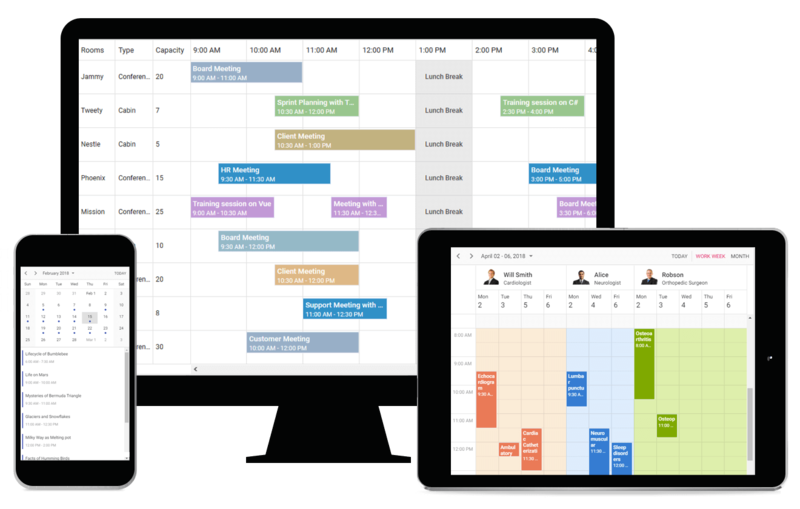 The ASP.NET Core Scheduler (event calendar) has a highly responsive layout and a finely optimized design for desktops, touch screens, and smart phones. It works well on all mobile phones that use iOS, Android, or Windows 8 OS. The ASP.NET Core Scheduler inherits almost all the calendar-specific features, such as first day of the week and timescale. Also, it allows you to customize the appearance of any part of the Scheduler interface using HTML and CSS styles. The modern and trendy UI design of the ASP.NET Core Scheduler makes the user interactions simpler and more efficient. It includes quick overview of event information, smooth date navigation, view navigation and easier selection of cells and events. Real-time appointment data of Outlook and Google Calendar accurately synchronizes with our ASP.NET Core Scheduler. It also supports bidirectional data communication through SignalR.